Since we’re on a bit of a hummus bender, I decided to branch out this weekend and make both roasted garlic hummus and spinach and feta hummus. 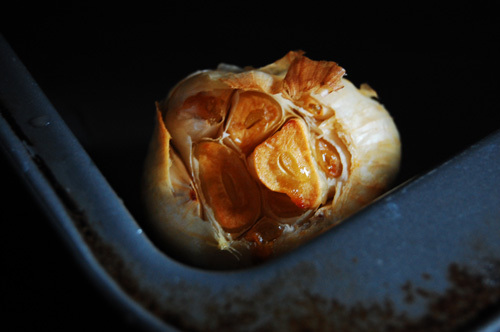 I had never roasted garlic before, and I thought it was a good skill to have (think of how many delicious dishes include roasted garlic). I did some research, and although there seemed to be some technique variations, I followed the trends, and this weekend I roasted my first garlic. I decided to roast an entire head of garlic, because with hummus, you need a strong flavor to overtake the garbanzo beans. I learned that while roasting garlic you can either roast an entire head, or, you can just roast cloves. 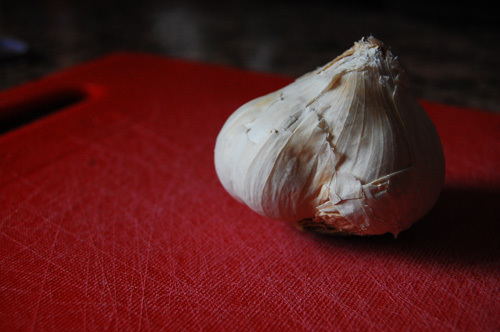 Either way, it is very important that the skin (the papery layers that surround the “meat” of the garlic) stay in tact. The skin functions as a high-temperature barrier for the meat. Like roasting other vegetables, when roasting garlic you need high temperatures and a fatty lubricant, in this case olive oil. 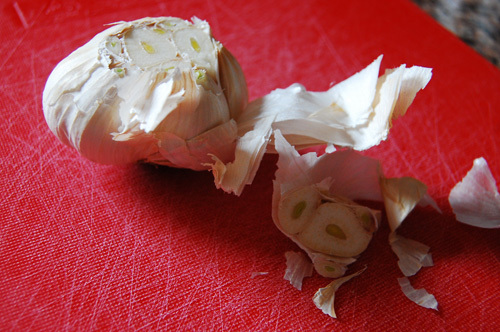 It is also important that you cut off the top of the head, so that some of the garlic is exposed. I found that cutting off the top, drizzling oil over the head, and then roasting for 30 minutes at 400* worked perfectly. I also covered the pan in aluminum foil, so that the garlic would also get a nice steam. 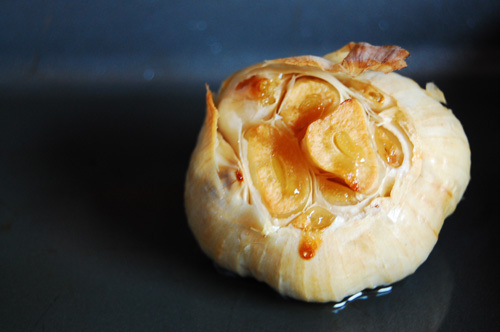 The best thing by far about cooking with roasted garlic is getting the garlic out of the skin. You know that scene in The Little Mermaid where Ursula picks up one of those plant things and squeezes it to put on her lips as lipstick? The very visceral quality of the popping coral or anemone or whatever it is has stuck with me my whole life. And the experience of squeezing roasted garlic out of its skin into my food processor was as close as I am ever going to get to squeezing underwater plants onto my lips.